Detection and treatment of human papillomavirus (HPV) and cervical precancer through screening programs is an effective way to reduce cervical cancer deaths. However, high cervical cancer mortality persists in low- and middle-income countries. As screening programs become more widely available, it is essential to understand how knowledge about cervical cancer and perceived disease risk impacts screening uptake and acceptability. We evaluated women’s experiences with a cervical cancer education strategy led by community health volunteers (CHVs) in Migori County, Kenya, as part of a cluster randomized controlled trial of cervical cancer screening implementation strategies. The educational modules employed simple language and images and sought to increase understanding of the relationship between HPV and cervical cancer, the mechanisms of self-collected HPV testing, and the importance of cervical cancer screening. Modules took place in three different contexts throughout the study: (1) during community mobilization; (2) prior to screening in either community health campaigns or health facilities; and (3) prior to treatment. Between January and September 2016, we conducted in-depth interviews with 525 participants to assess their experience with various aspects of the screening program. 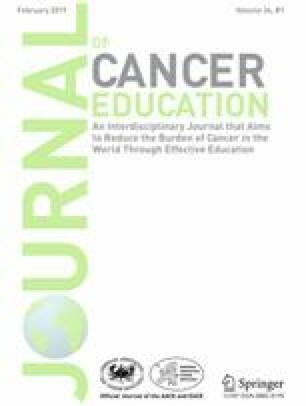 After the context-specific educational modules, women reported increased awareness of cervical cancer screening and willingness to screen, described HPV- and cervical cancer-related stigma and emphasized the use of educational modules to reduce stigma. Some misconceptions about cervical cancer were evident. With effective and context-specific training, lay health workers, such as CHVs, can help bridge the gap between cervical cancer screening uptake and acceptability. We would like to acknowledge the participants as well as the health care providers and research assistants for their support of and contributions to this project. We would also like to acknowledge for Katelyn Bryant-Comstock for assistance with editing of this manuscript. All authors were involved in the preparation, review, and editing of the final manuscript. MJH conceptualized the study and led the data collection. SO and EB led study activities on the ground and assisted in conceptualization of the analysis. YC wrote the manuscript with contributions from the authorship team (SO, KA, EB, and MJH). This study was funded by the National Cancer Institute, R01 CA188428. Written informed consent was obtained from each participant in her preferred language and ethical approval was obtained from the Kenya Medical Research Institute Ethical Review Committee, Duke University and the University of California, San Francisco’s Committee on Human Research.